Even the largest avalanche is triggered by small things. If this saying is to go by, Tribute âBirdieâ Mboweni is a true testimony to how big things can really come in small packages. With this album, also titled âBirdieâ, Tribute has triggered an avalanche. As a singer and songwriter Birdie is proving to be a force to reckon with. Her voice is so strong, soulful and wrapped up in both neo-soul, pop world and yet so jazzy. Birdie has joined a new breed of soul musicians that are putting their own modern take on the classic sound, and doing it justice. Her voice evokes raw, organic emotion that penetrates deep into your heart and makes you feel some type of way, however you want to define the feeling. Recently selected to perform amongst the graetest musicians at the Cape Town International Jazz Festival on the 1st April 2016, Tribute Birdie Mboweni is definitely the latest edition to what already is a highly competitve music scene but has fast claimed her space. This petite singer has worked diligently to carve a path that ensures that she too has a place in the music industry. 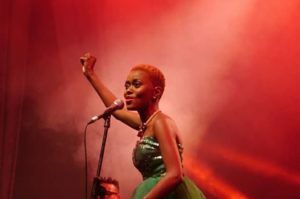 She launched her album in May 2015 at a fully packed Orbit Jazz restaurant in Braamfontein, Johannesburg and also at Ditsong Historical Museum in Pretoria. 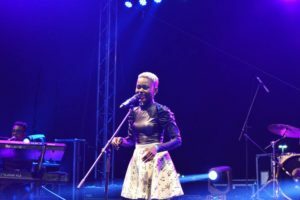 In four months since the release of her debut album, Tribute Birdie Mboweni has performed in big festivals including her performances at The Bush fire Festival in Swaziland end of May 2015, performing, opening for Judith Sephuma at the State Theatre in Pretoria on the 18th July 2015, performing alongside South Africaâs greatest at The Premium Jazz festival at Carnival City on the 22 August 2015 and closed the year with a performance at the Annual All Jazz Festival in Mabopane, pretoria. It is no surprise that The Cape Town International Jazz Festival has just recently announced Tribute Birdie Mboweni as one of the artists officially booked for the festival in March 2016. Besides this album being her debut offering, Tribute has long carved her niche as a performing artist having serenaded audiences in the Middle East (Qatar and Dubai) where she took up artist residence playing with a jazz band featuring some of South Africaâs great musicians. No stranger to the stage, she has performed at internatinal events such as at COP17 as well as at the Earth Fest in Zambia, including a string of local concerts including the Grahamstown National Arts Festival where she gave a stellar performance and receiving great reviews for her soulful offering. Spotted at the Born to Be Famous Showcase by the labelâs founder and owner, award-winning producer, Sipho Sithole aka Malambule, Tribute has recorded an album that teaches us that music recognises no barriers and can penetrate the hardest of hearts and unwrap the most hidden emotions of love long lost in despair. In her own words, Tribute testifies that she âfound joy not in finishing the album but in the activity that went into crafting and recording it, which proved that the ultimate measure of success is the actual journey and not the destinationâ. Her music expresses deep feelings and is profoundly emotional, jazzy, ethno and yet so soulful. The 16-track album is full of songs that make one instantly fall in love with Tribute âBirdieâ Mboweni. Nginjenjenje is written in appreciation of everyone, including my family and friends, who has supported me and loved me through the good and challenging times. This is me saying, I would not have done the things that I have done so far, without your love and support. Hold On is an encouragement to any and every person who is going through some or other challenge; whether it be finance related, matters of the heart or challenges that affect those who are dear to us. This song aims to encourage you to hold on because eventually, it does get better. Coffee is simply an introduction to me: A laid-back, short and doe-eyed woman who cares about creation and humanity, who mostly chooses not to fret over the small things that most people often worry about. Not For Me expresses a feeling of uncertainty over whether to stay or walk away from a relationship. The person in question feels that she is somehow being shut out, which results in the question of whether to stay or walk away. Soul ân Heart is a tribute to my late Mother, Busisiwe Sibeko, who passed on 7 years ago. In this song, I tell her of my ever-present love for her, how it feels like she was here just yesterday; and I give her an update on my younger siblingsâ growth. This was by far the hardest song to record, and one I am happy I finally managed to write. MaGumede is a tribute to Mama Dorothy Masuka, this after being honoured to be the face of the 2014 Moshito Music Conference alongside her; and being handed a microphone by her as a baton that I should continue to run with. This is my version of the song MaGumede, which is originally hers. Nâwarikapanyana is an ode to the black-shouldered kite, a bird I grew up knowing as nâwarikapanyana. The chorus of this song is a song that we used to sing when we were young, at the sight of the black-shouldered kite, also known as xikhozana in Tsonga. Because of its flight behavior when hunting for rodents, we were certain that the birdâs sudden flapping of its wings is prompted by us singing to it; telling it to flap its wings lest we burn its beak. The song also gives an account of the birdâs flight behavior. Having developed an interest in birds while studying Ecotourism, and having worked with birds while on Dassen Island, itâs no surprise that I should have a song that is an ode to a bird. Mpfula Ya Na is a celebration of the rain. The chorus is a song that we used to sing as children growing up. We would sing this when it rained, mentioning the harvest that would surely follow as a result of the rain: Marhanga (pumpkin), swifaki (corn), timanga (peanuts), makwakwa (green monkey orange). The song in its entirety speaks of how the summer season has come, and that it brings with it, the rain. It encourages people to take to the fields with their working tools to go and prepare the soil and plant anything that could be planted. Because of how joyful we would be when singing about the rain, the song also recognizes and speaks of the joy that fills the atmosphere as a result of the downpour of the rain. No More details the suffering that humanity all over the world is faced with as a result of the wars and the bloodshed that come with them. This song is a cry to the world, for peace. It simply says, it is enough! Bombani is a celebratory song. It speaks of a celebratory ceremony that is happening in the family, and encourages the people to wear their traditional attire, dance and show off their beauty. Summer Day is a jolly song that celebrates children. It encourages everyone to love, embrace and let them just have fun playing, dancing and singing. Khomanani, which means âUniteâ was written to encourage Africans to unite and to realise that although we may come from different parts of the continent, we all are the same, and so are the challenges we all face. It would do us well to embrace each other and unite in tackling the socio-economic challenges which we all face. Lerato is a conversation between a woman and her lover. The woman is reminiscing about and detailing the dynamics of the relationship, and essentially how she feels about this person, starting from the first day they met; while her lover is reassuring her and asking her to trust in their love for each other. Recorded and Mixed at Native Rhythms Studios, Johannesburg by Sthembiso Twala. Mastered by Rogan Kelsey at Lapdust Studios, Johannesburg. Perhaps Contraption is a multi-award winning, progressive brass band from London. Part choir, part chamber orchestra, part avant rock troupe, they create a truly unique musical experience; melding elements of jazz, punk, art pop and post-minimalism. Their intense, exuberant shows won the Haizetara International Street Music competition (Spain) in 2014 and 2015, the judgeâs prize at Cirque et Fanfare Festival (France) and Help Musicians Emerging Excellence Award in 2013. They have performed at places as diverse as Glastonbury Festival, The EFG London Jazz Festival, The Royal Academy of Arts, Aldeburgh Festival, Bestival, Sudtirol Jazz Festival (Italy) London Roundhouse, Cross Linx Festival (Netherlands) Wilderness, Southbank Centre, Latitude, Artisti in Piazza (Italy), Buskers Bern (Switzerland), numerous Honk! Festivals (USA) and touring in support of Amanda Palmer throughout Europe. Whether leading jubilant parades, amplified stage shows, or pop up street performances, Perhaps Contraption create an unforgettable sonic spectacle. Their new avant-brass monolith, Mud Belief, is out now.